On December 7, 1941, the Japanese navy and air force attacked the United States army, navy and air force units at PEARL HARBOR, HAWAII in what was called "A SURPRISE ATTACK." The next day, President Franklin Roosevelt called the attack "A DAY OF INFAMY," and asked Congress for a Declaration of War. It was granted, and America was in WORLD WAR TWO. Many at the time questioned how "A SURPRISE ATTACK" could have happened, and whether President Roosevelt should have known about it in advance and warned our forces in Hawaii. NINE CONGRESSIONAL investigations were conducted, during and after the war, and each examined the question: DID PRESIDENT ROOSEVELT KNOW ABOUT THE ATTACK BEFORE IT HAPPENED, AND IF SO, WHY DID HE DO NOTHING TO PREPARE OUR FORCES. And NINE CONGRESSIONAL INVESTIGATIONS all concluded that ROOSEVELT DID NOT KNOW IN ADVANCE! 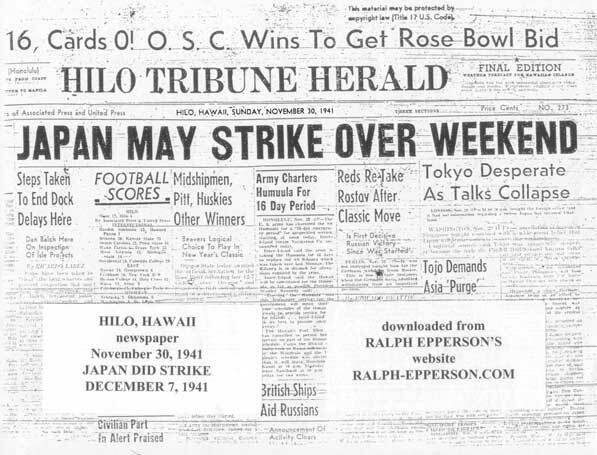 A few years ago, I saw a photo copy of the HILO, HAWAII TRIBUNE HERALD newspaper of November 30, 1941, the Sunday before the attack. I called the library in HILO, HAWAII and they photocopied the top half of their front page and sent it to me. meaning the following weekend, Saturday, December 6th and Sunday, December 7th, 1941. 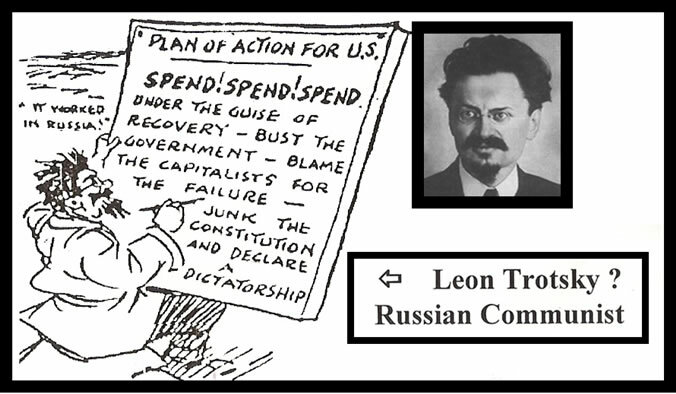 How could this NEWSPAPER KNOW IN ADVANCE, but PRESIDENT ROOSEVELT DID NOT KNOW? One could reasonably conclude that PRESIDENT ROOSEVELT'S INTELLIGENCE SOURCES were better than the NEWSPAPERS! In other words, NINE CONGRESSIONAL INVESTIGATIONS WERE WRONG: President ROOSEVELT had to have known ......... even a Hawaii newspaper knew!!! (If you want documented evidence that Roosevelt DID KNOW ABOUT THE ATTACK BEFORE IT HAPPENED, please read the pertinent chapter in the book I wrote entitled THE UNSEEN HAND, AN INTRODUCTION TO THE CONSPIRATORIAL VIEW OF HISTORY. It is discussed in the catalog that follows this report. 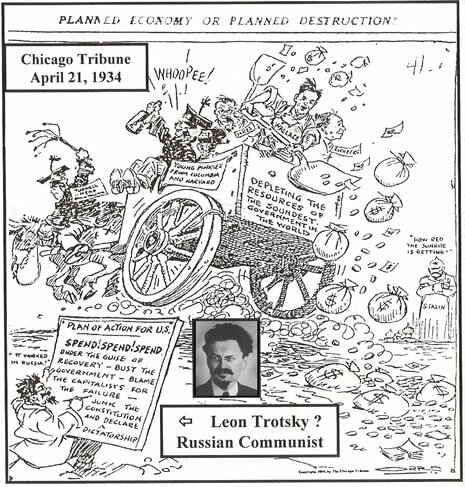 The Chicago Tribune tried to warn us about Barack Obama in 1934. Please notice the cartoon character in the lower left. Ralph Epperson is an historian, author, and lecturer who has been researching the CONSPIRATORIAL VIEW OF HISTORY (the view that the major events of the past have been planned years in advance by a central conspiracy) for 50 years. He has written or produced four "best selling" books entitled THE UNSEEN HAND, THE NEW WORLD ORDER, MASONRY: CONSPIRACY AGAINST CHRISTIANITY, JESSE JAMES, UNITED STATES SENATOR, six booklets, and 15 DVDs. He is a graduate of the University of Arizona, but freely admits that what he has learned since graduation has taught him that most of what he learned in college in History and Political Science simply is not true. He proudly states that his research has proven to him that there has been an active conspiracy in the world planning major wars, depressions, and inflations years in advance. 2012: RALPH EPPERSON, THE AUTHOR, IS STILL ALIVE! Another Ralph Epperson, the owner of radio station WPAQ, was a major player in the country music field, so successful that he was elected to the North Carolina Broadcasters Hall of Fame in the year 2006. I am sorry to hear of his passing on May 31, 2006, and wish to apologize for any problems my name might have caused him and his reputation in the past! But there was nothing I could do to alleviate any confusion between the two Ralph Eppersons. And I wish to salute his major accomplishments!!! This page contains reviews of material available through PUBLIUS PRESS. The index below will assist you in viewing the review that interests you. Bill Clinton supports a conspiracy! See the driver fire the fatal shot! Open, learn & adopt these principles - Your marriage will be blessed! ONLY THE U.S. HAS NUKES! Some believed that Barack Obama was "discovered" at COLUMBIA UNIVERSITY by ZBIGNIEW BRZEZINSKI, a professor of his during Obama's two year stay at that university. I have reduced many of the prices in this catalog (in May, 2010) to assist the American who is finding it difficult to earn enough to pay his bills. I am hopeful that this will assist in further proving that THE CONSPIRACY IS REAL ........ AND THAT THEY PLANNED THIS EVENT! On July 14, 1992, during his acceptance speech at the Democratic convention, then candidate Bill Clinton told the American people that he knew there was an "international network" at work in the world, and that "he had no aversion to it." "There does exist an international Anglophile [meaning basically English] network which operates in the way the radical Right believes the Communists act. In fact, this network has no aversion to cooperating with the Communists and frequently does so. I HAVE NO AVERSION TO IT." Quigley tells the reader how this network plans wars years in advance. This booklet or video provides the evidence that Bill Clinton learned his lessons well from the Professor and therefore believes the same thing. HE TOO HAS NO AVERSION TO IT! The day is November 22, 1963. The place is Dallas, Texas. President John Kennedy has come to the city and will be appearing in a motorcade through the streets of the city. He will be seated in an open air limousine, driven by a Secret Service agent. A spectator named Abraham Zapruder goes to the park near where the President's car will be driven, and records the entire scene in his motion picture camera. YOU CAN NOW WATCH THE FILM THAT HE MADE AND SEE THE DRIVER OF THE LIMOUSINE SLOWLY BRING THE CAR TO ALMOST A HALT, TURN AROUND, AND FIRE AN AIR-FIRED PISTOL AT THE HEAD OF THE PRESIDENT! The Humanists, those who believe in the Humanist religion, tells us that they find "insufficient evidence for a belief in the existence of a supernatural [meaning a God]". They also proudly boast that "the time has passed for theism [a belief in a God]". John Dewey, "the father of progressive education," America's leading figure in public education, and a believer in the Humanist religion, wrote "There is no God, and there is no soul." Yet the Humanists and John Dewey are dramatically wrong! You can know with scientific certainty that there is a God, and that there is no other option but a knowledge that He is real! ** Lee Harvey Oswald DID NOT SHOOT the President because photographic evidence exists showing that he was on the first floor at the time of the first show. And the Warren Commission that said he did, knew that! ** The hit movie "JFK" only told the American people half of the truth and BLAMED THE WRONG PEOPLE! ** Various layers and branches of government destroyed or altered crucial evidence, and altered the testimony of witnesses. ** Why did the American government plan the war in 1943? ** Why did the American government supply Russia with the 20th Century technology to wage the war, when they knew that they in turn were sending it to North Vietnam to kill Americans? ** Why couldn't the American generals and admirals win the war when they wanted to? ** How did three American patriots, not in the government, end the war years before it was scheduled to end? ** What role do DRUGS, especially heroin, play in the reasons America fought the war? Finally, someone totally connects the assassination of President John Kennedy to the War in Vietnam! The recent movie "JFK" was right in its claims that the President was killed because he wanted to end the war in Vietnam before it started. But the movie was wrong in its conclusion that it was "the military-industrial complex" that wanted the President dead. The truth is that there is no such thing! Ralph Epperson was one of the first to connect the assassination to the war in Vietnam, BUT HE WAS THE FIRST TO IDENTIFY THE REAL REASON THE PRESIDENT WAS MURDERED: DRUGS! The Great Seal of the United States, with all of its symbols and Latin phrases, has been reproduced on the back of the dollar bill. Yet few in America know what these things mean. It is a reasonable question to ask why this is so since the Seal was adopted by the Congress over two hundred years ago, in 1782. The key to understanding all of the phrases and symbols lies in the words "NOVUS ORDO SECLORUM," found under the pyramid in the Seal shown on the left side of the dollar bill. This lecture will explain what all of these symbols mean. Ralph Epperson will discuss how a SECRET SOCIETY, still active in America today, placed those symbols in the Great Seal. You will then understand WHY THESE EXPLANATIONS HAVE NOT BEEN PROVIDED TO YOU. * * Mr. Epperson will discuss the evidence that many of these nations have also signed a cartel agreement with some of "THE SEVEN SISTERS"
There are many people today who believe that there is a conspiracy at work in the world, and that it is LED BY THE JEWS. Historian and writer Ralph Epperson has discovered that those who believe this are DRAMATICALLY WRONG! He has been researching THE CONSPIRATORIAL VIEW OF HISTORY for over 45 years that traces it's ancestry back to the Egyptians. That means IT PREDATES THE JEWS! He has recently discovered that this 6000 YEAR OLD CONSPIRACY, called THE ANCIENT MYSTERY RELIGION, is led by a group of NINE "ADEPTS", calling itself THE GREAT WHITE BROTHERHOOD, and that their headquarters are in the nation known as TIBET! In 1987 and 1988, Ralph Epperson and a crew of seven volunteers produced 27 one hour television programs for a series he called SECRETS OF HISTORY. This series was primarily based upon the material found in his book entitled THE UNSEEN HAND, and was shown for some three years on the Tucson Community Cable station. Many of those who have watched this series have commented that for a bunch of "amateurs", this series was pretty well done. Mr. Epperson takes the viewer through over 200 years of American history, by showing how a conspiracy planned the American Revolution, the War of 1812, The Civil War, World Wars I and II, Korea and Vietnam, among other things. If you want to learn about the Conspiratorial View of History from one of the theory's great teachers, this series is for you. This is the carefully researched and documented book by historian A. Ralph Epperson. First published in 1985, it has now been reprinted 15 times, and is being published in five European countries. This book, a must read for those who wish to know why major events of the past have occurred, has been called "quite possibly the finest book ever written on this subject." Readers have praised Mr. Epperson's writing style, claiming that it is extremely easy to read for such a controversial and hard to explain subject matter. He first wrote the book as a textbook for his Community College classes. ** America is a "Fascist Oligarchy;"
** Why Evolution is a Fraud and a Hoax; etc. The world has been hearing George Bush (a Capitalist), Fidel Castro (a Communist) and Mikhail Gorbachev (now a "Social Democrat") talk about creating a "NEW WORLD ORDER." Adolf Hitler fought World War II to create a "NEW WORLD ORDER." And 50,000,000 people died because Adolf Hitler wanted the same thing that George Bush, Fidel Castro and Mikhail Gorbachev want. But few in America know what the phrase means! Ralph Epperson's book will tell you what it means and how it is connected to the "NOVUS ORDO SECLORUM" (translated to THE NEW WORLD ORDER) on the back of the American dollar bill. This book was written to serve as a warning to the American people because they would not select the NEW WORLD ORDER if they knew what it was. This book will be very disturbing to the reader. But it is better to be forewarned. Ask a candidate for public office this question: WHAT IS THE FUNCTION OF GOVERNMENT? and stand back to be amazed: Most won't know how to answer you! The question is simple and it can be answered in one short sentence, but in 30 years of asking maybe 50 candidates, Ralph Epperson has found only one who knew the right answer! Yet they wanted to be trusted with THE POWER OF GOVERNMENT! The booklet will carefully analyze GOVERNMENT and why PEOPLE CREATE IT. Then Ralph Epperson will lead you through a discussion of the various forms of Government, and why this nation's FOUNDING FATHERS hated DEMOCRACY! Included in the booklet will be a study of various forms of economic terms such as SOCIALISM, COMMUNISM, and the FREE ENTERPRISE SYSTEM. If I asked you after you read this booklet: What type of economic and political system do we have in America, your correct answer would be A FASCIST OLIGARCHY! back to index ONLY THE U.S. HAS NUKES! For over 50 years, ever since the United States dropped two atomic bombs on Japan to end World War II, the world has been caught up in a fear of a nuclear war. But historian, lecturer and researcher Ralph Epperson has discovered that that this THREAT OF A NUCLEAR WAR is A FRAUD, and that the only nation with NUCLEAR WEAPONS is the United States. That means this threat is imaginary, that a great ACT OF DECEPTION has been pulled off on the people of the world. One of the evidences is the Intermediate Range Nuclear Forces Treaty (the INF Treaty) signed in 1989 by Pres. Ronald Reagan and Russian Premier Mikhael Gorbachev. The Treaty "ELIMINATES" WARHEADS AND MISSILES WITHOUT EITHER NATION BEING ALLOWED TO VERIFY COMPLIANCE that warheads and missiles have been ELIMINATED! You will be stunned at the other evidence that Mr. Epperson has accumulated in this four hour DVD! And YOU WILL BELIEVE after you complete your viewing of the material! The American Constitution has been called "the finest document ever written by the mind of men!" The American people have been taught that it was written to restrict the power of government, and to protect their God-given unalienable rights to life, liberty and property. But Ralph Epperson has discovered the evidence that the men who founded this nation were not God-fearing patriots as we have been told, but occultic practitioners of a secret worship on this earth. In fact, he will discuss the evidence that our founding fathers created two separate governments in the Constitution at the same time, and ONE OF THOSE GOVERNMENTS WAS GIVEN ABSOLUTE TYRANNICAL POWER! And that this is the government ruling America today! He will also examine the Great Seal of the United States and its hidden symbols. 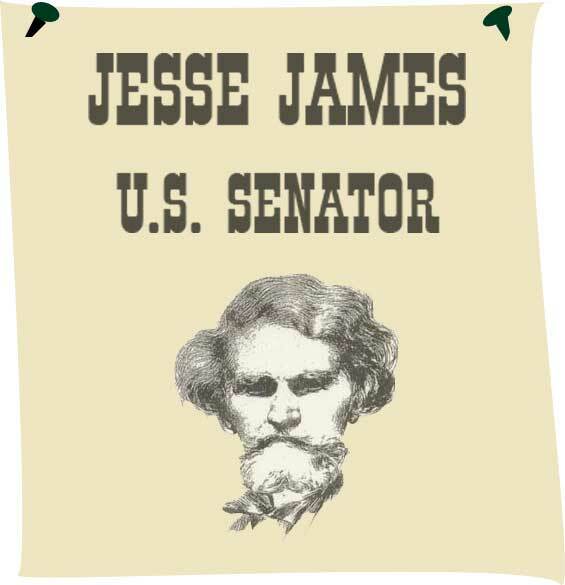 History has recorded that Jesse James, this nation's most famous outlaw, was shot to death by Bob Ford on April 3, 1882. So this headline appeared to be false. But it is the truth! to start a SECOND CIVIL WAR. back to index THE SHROUD IS GENUINE! In 1988, the Catholic Church allowed three scientists from laboratories specializing in "carbon-dating" to obtain pieces of the "Shroud of Turin," which many think was the actual burial shroud of Jesus Christ. TV cameras were rolling when the piece was actually cut from the Shroud in front of the scientists was taken from the room into a smaller room nearby, by the Cardinal of Turin, and two other scientists. These three men disappeared for one half of an hour, and when they returned, they gave the samples to the scientists. Two researchers have found out that the cloth tested by the laboratories did not come from the Shroud but from a relic called "the cope of St. Louis d' Anjou" worn from 1296-1297 A.D. After the substitute "shroud" was dated at around 1350 A.D. by the "carbon dating method," the real Shroud was called a "forgery." But, THE SHROUD IS GENUINE, because the piece of cloth tested by the three laboratories was a garment worn between 1296 and 1297! And these authors produced photographs to prove it! ** KARL MARX, the so-called "father of Communism"
** JOHN WILKES BOOTH, Mason, the assassin of President Abraham Lincoln. Portraits or photographs exist of each of them giving a secret symbol known as THE LION'S PAW, a symbol that reveals to the initiates of THE ANCIENT MYSTERY RELIGION known as LUCIFER (also known as Satan, the devil) WORSHIP that they are fellow believers. It seems that no historian has ever written about this symbol until Ralph Epperson discovered it and made it public. You can see his research with your own eyes! 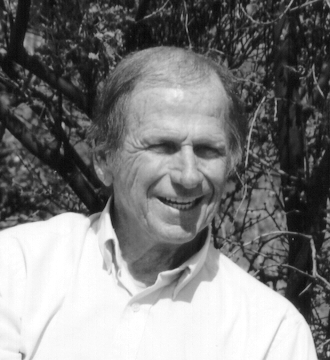 Howard Freeman, before he passed away, was perhaps this nation's finest expert on the Constitution of the United States of America. He often gave lectures around the country on the document and on the court cases decided on its provisions. Someone transcribed one of his 1990 speeches from off of an audio tape and made it available on the internet for anyone who wanted it. Ralph Epperson has pulled it off, formatted it, and added his comments, hopefully to add to its impact. It is Mr. Freeman's contention that the Uniform Commercial Code (abbreviated to the U.C.C.) has replaced the Constitution as the "Law of the Land". Mr. Freeman relates the story about how President Franklin Roosevelt called in all of the federal judges in America in 1938, and told them that the nation had been declared "bankrupt" by the international bankers. He told them to try all of their cases under the U.C.C. but that they were to "take silent judicial notice of that fact", meaning that they had to cover their rulings with words that sounded like they came from the Constitution. It is Ralph Epperson's contention that when this happened, it was no "Accident," but the carefully contrived set of circumstances brought on by a conspiracy dating all the way back to 1787 and the "Founding fathers" of America. He ends by telling the reader how he/she can get back to the Constitution in a court of law. THEY TOOK AN OATH TO DESTROY CHRISTIANITY! Their worldwide organization claims to "ordain kings and shape the destinies of worlds", and that is why powerful men such as these have joined it. Now, for the first time ever in their 6,000 year history, someone not a member has discovered that the evidence that this is their goal is from their own literature! Ralph Epperson has read 29 of their books from 12 of their top writers, and he also has found the evidence that their day of destruction had a definite date: January 1, 2000. Mr. Epperson will also explain why THIS EVENT DID NOT TAKE PLACE! THIS MARRIAGE PLAN WILL WORK! Divorce is increasing inside the United States and Ralph Epperson believes he knows the reason! He will present a SERIES OF MARRIAGE PRINCIPALS that are soundly constructed and if applied, should make any marriage a success. ** What was the technology that started re-educating America in the basic structuring of the American family? ** What was the VICTORIAN ETHIC that changed the way America viewed intimacy between a married couple? ** What is the principle exhibited in the business world and in the animal kingdom that illustrates an important principle of Marriage? You are urged to be OPEN and to learn these principles and if you adopt them, they will BLESS YOUR MARRIAGE! RALPH EPPERSON'S books on CONSPIRACY make excellent gifts for any occasion. If you agree with us at Publius Press that there is a CONSPIRACY at work in America, and because of this fact, this nation is in serious trouble, and that the only tool a moral people can resort to in a time of crisis is education, then why not consider giving books and tapes that discuss the evidence that this CONSPIRACY exists to your friends, business associates, relatives, and your Rabbi, Priest or Pastor. This book contains the evidence that JESSE JAMES, the famous outlaw, was not shot in 1882, but staged his own death so he could keep living without the threat of a reward over his head. And until he died in 1951, HE WAS A MAJOR PLAYER IN THIS NATION'S PAST IN SUPPORT OF THIS CONSPIRACY. you must print, fill out and send in the order form.